A pioneering deep-sea exploration robot—one of the first successful submersible vehicles that was both unmanned and untethered to surface ships—was lost at sea March 5, 2010, on a research expedition off the coast of Chile. 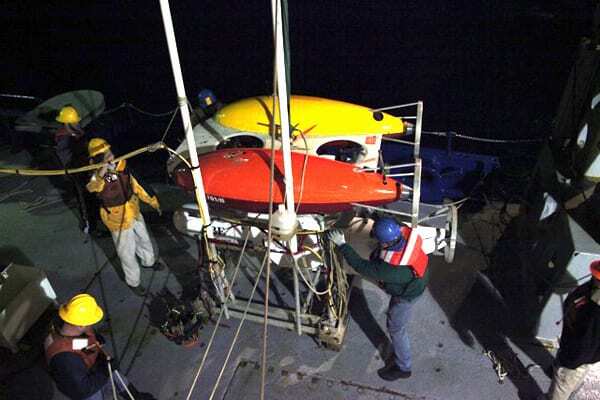 The Autonomous Benthic Explorer, affectionately nicknamed ABE, had reached the seafloor during its 222nd research dive when all contact with research vessel Melville abruptly ceased. Researchers believe the vehicle may have suffered a catastrophic implosion of a glass sphere used to keep ABE buoyant. An implosion, under pressure equivalent to more than two tons per square inch at depths of 3,000 meters (1.86 miles), would have instantly destroyed independent on-board systems to maintain communication and to bring ABE back to the surface in the event of failures. The loss had nothing to do with earthquake activity off Chile, the scientists said. “It revolutionized deep-sea exploration by expanding scientists’ abilities to reach into the deep,” said Chris German, National Deep-Submergence Facility chief scientist at WHOI and a co-chief scientist of the expedition off Chile. Built as a prototype, ABE became a workhorse. 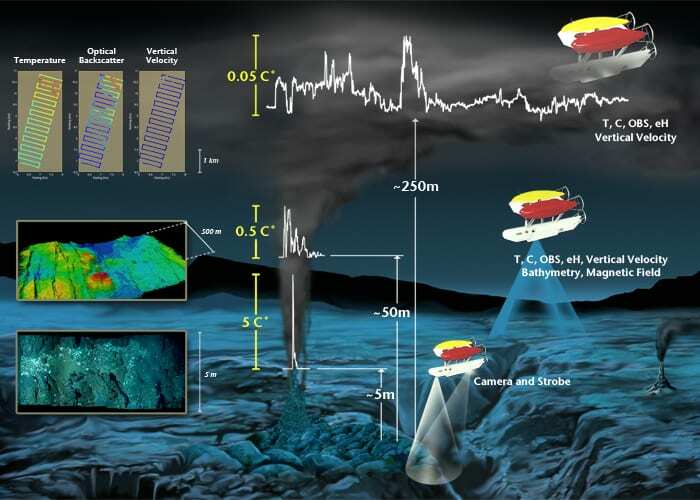 It was the first autonomous robot to make detailed maps of mid-ocean ridges, the 40,000-mile undersea volcanic mountain chain at the boundaries of Earth’s tectonic plates where new seafloor crust is created. It was also the first AUV to locate hydrothermal vents, where hot, chemical-rich fluids spew from the seafloor and sustain lush communities of deep-sea life. ABE explored seamounts, undersea volcanoes, and other areas with harsh, rugged terrain in oceans throughout the world and with scientists from around the world. “Mars may belong to the rovers, but the oceans belong to the Autonomous Benthic Explorer,” wrote the editors of Wired magazine in 2006 when it enshrined ABE among its “50 Best Robots Ever,” a compilation of real and fictional robots. The list contained cinematic robotic stars such as HAL 9000 (the calmly murderous computer in 2001: A Space Odyssey), R2-D2 of Star Wars fame, and the Terminator. But it also included the Mars rovers, life-saving medical devices, and military equipment such as Predator unmanned aerial vehicles and tank-treaded Packbot reconnaissance droids. The designation tickled Al Bradley, Dana Yoerger, and Barrie Walden, who designed and built ABE with fellow WHOI engineers Rod Catanach, Al Duester, and Steve Liberatore. Recognizing ABE’s coincidental resemblance to the Starship Enterprise, they playfully stenciled “NCC-1701” on ABE’s flanks—the same numbers that adorned the fictional Star Trek spaceship. In 1995, WHOI geophysicist Maurice Tivey offered to bring ABE along on a voyage that he and University of Washington scientist Paul Johnson were leading to the Juan de Fuca Ridge off the U.S. Pacific Northwest. Carrying a magnetometer, ABE’s steady, low-flying ride and precise navigation allowed it to collect impressive measurements of magnetic properties of newly erupted lava on the seafloor, demonstrating its abilities as a deep-submergence surveying tool. Nevertheless, the ABE team could not get funding to use ABE again until 1999, for a voyage to the East Pacific Rise mid-ocean ridge led by Marie-Helene Cormier and Bill Ryan of Lamont-Doherty Earth Observatory. “If we failed, it probably would have been our last chance,” Yoerger said. 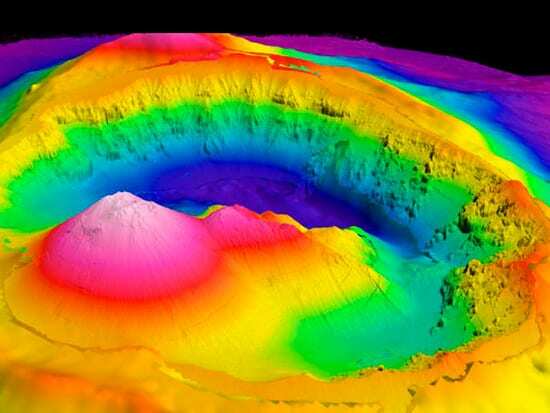 The team added a scanning sonar that could make seafloor maps that displayed fine details of volcanic and geological features. The cruise launched ABE’s early career as scout and cartographer, working in tandem with other vehicles. ABE would dive at night and resurface in pre-dawn light. Researchers would download ABE’s data, create fresh seafloor maps of the area, and hand them to Alvin pilots and scientists about to descend to the seafloor. 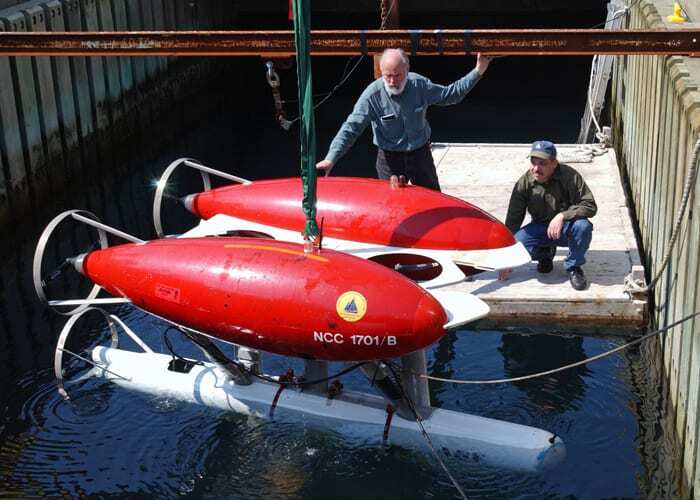 Over the next few years, with funding from the National Oceanic and Atmospheric Administration, the ABE team improved the AUV’s capabilities, adding more advanced sonar, navigation, battery systems, and sensors to measure temperature, turbidity, and chemicals in the water. With those sensors, ABE launched a new career as a “bloodhound” sniffing out and homing in on seafloor hydrothermal vents and the communities of deep-sea life surrounding them. The same ABE team went on to build a direct descendant, a new AUV called Sentry, which was launched on its first scientific mission in 2008. With Sentry online, ABE was being transitioned into a new role as an engineering development platform to test new concepts—“put out to stud,” Yoerger joked. 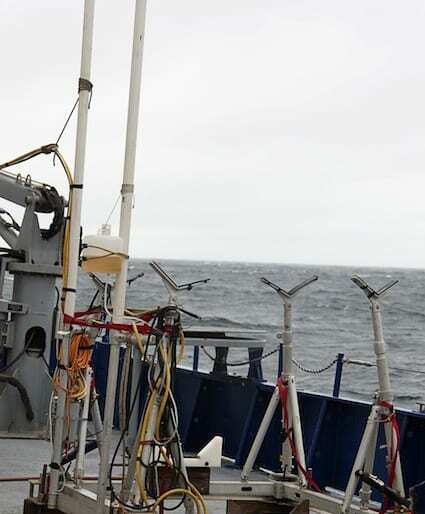 But Sentry had already been committed to another research expedition this March, so ABE was brought back into service for a mission to explore the Chile Triple Junction, the only place on Earth where a mid-ocean ridge is being subducted (or pushed beneath) a continent (South America) in a deep ocean trench. A few days after ABE disappeared, he wrote, “We’ve shed our tears for our robotic friend, we’re ready to move on. My e-mail inbox has been full with messages from friends and colleagues all over the world, expressing their regrets, boosting our spirits, and assuring us that ABE‘s legacy as a pioneering explorer of the deep sea will endure. Share or read stories about about on Woods Hole Oceanographic Institution’s Facebook page. ABE is launched on the night of March 4, 2010, from the research vessel Melville for what turned out to be its final dive—to explore the Chile Triple Junction off the Chilean coast. Tending the lines are (clockwise from right): Al Duester, Tim Shank, Jim Dorrance, Sean Sylva, and Andy Billings. Equipped with sonar, sensors, and cameras, ABE was a scout, cartographer, and bloodhound. It made high-resolution maps, “sniffed out” unusual chemicals emerging from the seafloor, and photographed biological communities and complex geological features. On a typical mission, it used all its capabilities. 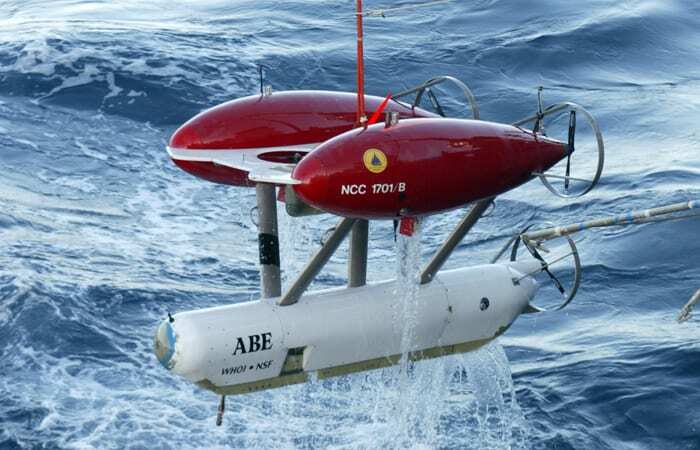 First, ABE was programmed to “fly” about 250 meters above the seafloor using sensors measuring temperature, turbidity, and chemicals in the water to “sniff” plumes from hydrothermal vents. Then ABE was programmed to fly closer to the seafloor, making detailed maps of the seabed and, ideally, to intercept the stems of hot buoyant hydrothermal plumes of water rising up above the seafloor and home in on them. Finally, ABE was programmed to descend to right above the seabed and drive to and fro, very carefully—using techniques to avoid crashing into the rough rocky terrain—while taking photographs of seafloor features and deep-sea life. Painting with sonar, each brushstroke a “ping” of sound reflected off the seafloor, ABE created a seafloor map of Brothers Volcano about a mile deep in the Pacific Ocean and roughly 290 nautical miles northeast of New Zealand.